The Directional Movement Index (also known as DMI) is a momentum indicator that was developed by J. Welles Wilder. The DMI is actually part of a series of technical indicators developed by Wilder, so some trading platforms split up the indicators, providing Directional Movement as one indicator and ADX as another. Typically, these indicators are used together to form the DMI. Directional Movement shows whether downside or upside movement is stronger, and ADX shows the strength of that movement. How these can help you in making trading decisions is discussed below. The DMI is a technical indicator that is typically shown below or above the price chart. It is calculated by comparing the current price with the previous price range. DMI then displays the result as an upward directional index (+DI) and a downward directional index (-DI). The DMI also calculates the strength of the upward or downward movement and displays the result as a trend strength line called Average Directional Index or ADX. +DI and -DI show up as two separate lines, colored green and red respectively. When the red line is above the green line, it means the price is dropping. When the green line is above the red line, it means the price is rising. If the -DI and +DI are crisscrossing back and forth, there likely isn't a price trend going on, and the price is moving sideways. ADX is a third line on the indicator, and it shows the strength of the trend. So while the -DI and +DI help highlight direction, ADX focuses on how strong the uptrend or downtrend is. An ADX reading above 25 signals a strong trend is in place. When the ADX is oscillating below 25 it usually means there isn't a strong trend, and the price is moving sideways or within a weak trend. The attached chart shows a one-minute chart with ADX and Directional Movement lines (-DI and +DI). In the chart, the indicators are separated to avoid clutter, but it is possible (and common) to have the ADX, -DI, and +DI all shown in one window (instead of two). The indicators can also be used separately, though. 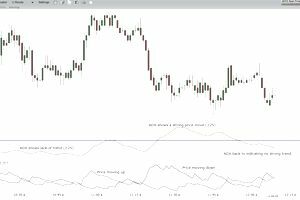 Some traders may only choose to view the ADX for trend strength, while others may prefer only viewing the Direction Movement lines to aid in confirming price direction. The Directional Movement Index can be used in both ranging and trending markets. In general, when the +DI line is above the -DI line, the market is moving upwards, and when the -DI line is above the +DI line, the market is moving downwards. If trading a trending strategy, favor long positions when the +DI is above the -DI line, and try to avoid long trades when the -DI is above the +DI. When the -DI is above the +DI, favor short positions, and avoid taking short positions when the +DI is above the -DI. The ADX line shows the strength of the price move. The market is considered to be trending when the ADX line is above 25, and ranging when the ADX line is below 25. Many trades also consider an ADX reading above 20 as trending, and below 20 as non-trending. Used in conjunction with the Directional Movement uses discussed above, ADX can act to further filter or confirm trade signals. If trading a trending strategy, the ADX should ideally be above 20 (or 25) for taking trades in potential uptrends or downtrends. For trading strategies that trade ranges (sideways movement) then ADX should be below 20 (or 25). The DMI indicator is actually a couple of indicators which can be used together (or on their own)--the Directional Movement lines (-DI and +DI) and the ADX. When +DI is above -DI the price is moving higher, and when -DI is above +DI the price is moving lower. ADX shows the strength of that movement, with a reading above 25 (or 20) showing a strong trend, and readings below 25 (or 20) showing a lack of a clear trend, a weak trend or sideways movement.